Yes, you have my blessings for the gayatri initiations of Jaya Deva Das Brahmacari and your wife Tilaka Devi Dasi. I am enclosing herewith a tape of the gayatri mantra chanted by me along with two copies of gayatri mantra and one sacred thread, duly chanted on by me, as well. The process should be that you let each of them hear the tape individually (through earphones). Show them how to chant on the fingers. Let them read the mantra and listen to the tape. Then, on my behalf you can present the sacred thread to Jaya Deva. Then hold a fire Yajna as you have seen done so many times before. If there are any questions about procedure, etc, you can consult with Karandhara and he will instruct you properly. I am so glad to hear that, because the sales manager of Darigold dairy is sympathetic to our Krishna Consciousness movement, you are being supplied 20 gallons of fresh milk weekly and free of charge. He is a good friend so keep him posted of our activities and encourage him sufficiently. Perhaps he will become our life member also. I have received one letter from Gaura Hari about his travelling sankirtana party across Canada and have given my blessings for such venture. And also I have noted how nicely Tulsi Devi is growing there in Seattle. Already she is three feet tall. That is a true credit to your devotion. Thank you very much. Please accept my blessings. I beg to acknowledge receipt of your letter undated after such a long time and I have noted the contents carefully. I have handed your letter over to Syamasundara for a point by point reply, but one thing is that if it is not possible to get Indira Gandhi or the Governor or the American Ambassador for the festival at Mayapur, then what is the use? In that case, the program should be cancelled until some later date. My going there depends on whether such meeting can be arranged; otherwise there is no need in my going. I have got so much engagement here and have resumed my translating work also. So do your best to see that one of these big officials comes to Mayapur for the cornerstone ceremony and let me know as soon as possible what arrangements have been made. P.S. (1) By the 20th July I will be in N.Y. at least for a week. (2) By the 1st August I will be in London. (3) (?) please find one letter from Mr. Mukherji(?) & do the needful. (4) If Bombay(?) management is going well, then Gurudasa may go there (?). Send me one letter weekly. Please accept my blessings. I am in due receipt of your letter dated 10th July, 1971 and have noted the contents carefully. So far as black and white photographs of paintings, I don't like that idea. How expensive they are doesn't matter but colored photographs should be there only. The picture of Sadbhuja, 6-handed Lord Caitanya, anyone can paint, it doesn't matter, but it must be done very nicely. Bhisma was lying on the bed of arrows on one side of the battlefield. There was trees and grass, but no dead men were around. Only there was the Pandavas. Krishna and great sages such as Vyasa--big, big men. Krishna was in the forefront in His royal dress. Bhisma was a stout and strong old man. The arrows were piercing his body only. They did not go all the way through. The arrows piercing his back were supporting his body and there were many arrows piercing his chest. There were no arrows in his head. A sunset scene is all right. Please accept my blessings. I am in due receipt of your letter dated 31st June, 1971 and have noted the contents carefully. Yes, we were in Moscow for five days. The city is very clean but the socialistic government is not very good. Only you can take what the state supplies. There is very little freedom there. Anyway, there is hope for opening a center in the future; we have made some friends there. From Moscow I came to Paris, L.A. and then attended the very successful Rathayatra festival. Now I am again in L.A. and will begin making my way back to Calcutta beginning in the 16th instant. So I hope things are going on nicely for the Mayapur festival. I have had no letter from Tamala since I have come here. So you mentioned in your letter about an appointment with S. S. Dhawan. What is the result? No one has informed me. Whether the appointment actually took place? In this connection, Syamasundara already sent one letter to Tamala to let us know and do the needful. Unless some big man lays down the corner stone, our whole attempt will be frustrated. Actually the function in Mayapur will be held for this purpose. Yes, it is not a bad idea to have Sankirtana as you have described because Lord Nityananda Prabhu, he personally went to troubled area of Jagai and Madhai and he conquered them. They became devotees. 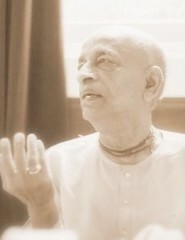 Nityananda Prabhu was injured also. So when Sankirtana is in a troubled area, do it very carefully. It is a good idea, but you must be very careful at the same time. It is not contradictory to our principles. Rather it is a great service. But the difficulty is that you cannot speak in the local language. So under the circumstances simply Sankirtana party chanting will do. Please offer my blessings to the others and let me know very soon what are the new developments. P.S. Why not try the American Ambassador? Please accept my blessings. I beg to acknowledge receipt of your letter dated 26th June, 1971 and have noted the contents. I am so much encouraged to hear how nicely you are distributing BTG and distributing our books also. So continue this program whole-heartedly and Krishna will surely bless you. It is also encouraging to note that you are getting such a fine house for your new temple. It is so large and on the main street of Cleveland. I can tell that you are all sincere devotees because Krishna is giving you such nice facility to serve him. So make the house very gorgeous, to the standard of our L.A. and N.Y. temples and when you are ready, Radha and Krishna can be installed there also. So far as ordering prints of Krishna from Jayapataka, all the GBC members here agree that it is not such a good proposal. It is much better, first of all, that these prints be gotten from us just as soon as they are printed up. Also it is much more important that you utilize your valuable time and energy to distribute our magazines and books. That is real propaganda work. And the householders can earn their livelihood by distributing our books also. That is one of the points of our new book distribution program and you can get more details from Karandhara or Rupanuga. On Friday, 16th July, I will be going to Detroit for two days. So if you would come and see me at that time, that would be very nice.Please offer my blessings to all the boys and girls there in Cleveland. Hoping this will meet you all in good health. Please accept my greetings. I am in due receipt of your letter dated 2nd July, 1971 and have noted the contents. Presently I am out of Calcutta. So it is better if you are still interested in our Mayapur project to see the Mayapur committee. and speak with them at our temple at 3, Albert Road; Calcutta-17. The committee. is in charge of all these affairs and if they are in need of your service, that will be very nice. Please accept my blessings and offer the same to your wife Krishna Devi, daughter Visnu Arati and Kulasekhara Prabhu. I am in due receipt of your very encouraging letter dated 30th June, 1971 and have noted the contents carefully. Your endeavor is very much appreciated. Thank you very much. You have my all good wishes. Success or no success, it doesn't matter; you have come to Israel with your family and that is my pleasure. All blessings upon you. So for the time being, you can stay in your apartment, have discourses and hold kirtana and whoever voluntarily may join, no one can object. Whoever comes, give him nice prasadam. For the time being this can be done. There is no need of outside engagements if they are not possible to get. If you can, that's all right. But inside activities should go on. So live peacefully and whatever service you can render is all right. You should preach on the position of God. You can describe how God Consciousness can be developed. We are not presenting another God. We shall talk on God, his nature, His exalted position, his omnipresence and how we can realize him. For example in Bhagavad-gita we can realize, as it is stated there, that God is in everything extraordinary. We can realize God in the taste of water. When we are thirsty and drink water, the nice taste which quenches the thirst, that is God. So gradually you can introduce and disclose that according to the Vedic faith God is called Krishna, just as he is called Jehova or Allah. Indirectly you can say that God has no name but because we are accustomed to understanding everything by giving some nomenclature, so God has names which are ascertained by His activities. For example God is creating, so if I call God "the master of the world" (Jagadisa) then what is the wrong there? And who can deny that God created the world? We are not concerned with the common man because they will think that we are criticizing. So speak on general features of how we understand God. God is called great in every religion. Our appreciations of greatness are six in number. These are stated in the Krishna Book Introduction. So you have to introduce the matter of God scientifically, and that will be appreciated by any reasonable man. If we say that your God is like this and our God is like that, then there will be great disturbance. Simply speak on general topics, that God is like this. Then let them read our literature and ask questions. In this way try to push on our missionary activities. P.S. In answer to Krishna Devi's questions: I have not received your cook book as of yet; mustard seed, etc.--these are exciting spices and should be avoided; Vegetable ghee is all right if real ghee is not available or easily acquired. So far my coming to Israel, I will be glad to come but I do not know yet if it is possible. But when my program is fixed up I will let you know, probably by the first week in August. Please accept my blessings. I am in due receipt of your letter dated 7th July, 1971 and have noted the contents carefully. I am glad to note that you have received tapes no. 2-4 and you are appreciating the narration of Dhruva Maharaja also. I have just received the transcription and laid-out pages for tapes no. 1 & 2. It has been done very nicely. One point though is that Jayadvaita writes that the synonyms for the last 18 chapters of 3d canto and the first seven chapters of fourth canto are not there. Where have they gone? I do not understand. Anyway, I have begun dictating the synonyms, and tape no. 6 was sent directly to Pradyumna. To finish these synonyms will take at least one month. Arrangements are being made for us to leave for Detroit on the 16th morning. We will stay there for two days and then come to Boston for a few days also. Then we will go to N.Y. so I don't think there will be time for going to New Vrindaban just now. So Kirtanananda Maharaja needn't send tickets. Please accept my blessings. I am in due receipt of your letter dated 10th July, 1971 and have noted the contents. I have received the laid-out sheets for tapes no. 1 & 2 and they are very well done. Thank you very much. I was so much pleased to see that already the tapes were edited and laid out and this is encouraging me to translate more and more. You can give ch. 8 of S.B. canto 4 the title "Dhruva Maharaja enters the forest to meet the Lord." One point is that I do not understand how it is that the synonyms for the last 18 chapters of the 3d canto and the first 7 chapters of 4th canto are missing? Anyway, I have begun this work and the first tape of synonyms, tape no. 6, was sent to Pradyumna today. This work will take at least one month to complete. Very soon I am coming to N.Y. and we can discuss further on these matters. Hoping this will meet you in good health. Please accept my blessings and offer the same to your good husband Gaurasundara and all the others there also. You will be glad to know that I have received your mangos just yesterday and they were so first class. Thank you very much. Now they are all finished. So I am thinking why you don't send one carton full of unripe mangoes here? That would be very nice. Whatever arrangements have to be made to ship mangos here, that is all right. You are so kind and I am always thinking how nice devotees are you and your husband. Thank you very much. Please accept my blessings. I have not heard from you in such a long time and am anxious to know what is your program there in Kuala Lumpur; how long will you be staying, how construction is going on, what plans are being made there, etc. So please let me know all the details as soon as possible. Presently I am in L.A. and everything is very nice here. You will be glad to know that I have again begun my translating work and have sent five tapes to Satsvarupa thus far. Very soon though I will be going to N.Y., probably by the end of this week. From there I will go to Europe and then on to Mayapur for the founding stone ceremony. So most probably we will meet again at that time. So please let me know how you are doing there right away. I am anxious to know. Please accept my blessings. I beg to thank you very much for your kind letter dated 7th July, 1971 and at the recommendation of both Bhagavan das and Bahulasva Prabhus I have gladly consented to accept you as my duly initiated disciple. I can tell from your letter that you are certainly most qualified. You are very sincere boy and have been chanting your 16 rounds of beads regularly and strictly following all the regulative principles. Continue this program faithfully and your rapid advancement in Krishna Consciousness will be certain. I have given you the spiritual name Urukrama Dasa Brahmacari. Urukrama is a name for Krishna and means one whose activities are glorious. So go on with your devotional activities there in Chicago whole-heartedly and always depend on Krishna. Just like you said that you had been experiencing so many difficulties, but that is Krishna's mercy upon you to make you turn to Him more and more. So work cooperatively with Bahulasva Prabhu and make our Chicago center a grand success. That is my request to you, so work in that way with full enthusiasm. And stay strong in Krishna's service by regularly chanting your rounds, by reading our literatures, by going for Street Sankirtana, etc. In this way go on and you will be happy and your life will know success. Please accept my blessings. I beg to acknowledge receipt of your letter dated 4th July, 1971 and have noted the contents carefully. Yes, I am so glad to hear about your travelling Sankirtana Party. That is very good news. So engage yourself in this program whole-heartedly. I have got all my blessings on you and the other members, so do everything nicely. And it is very encouraging to hear that so many new devotees are coming. That is an indication of your sincerity. The more sincere you are in pushing this movement forward, so Krishna will reciprocate and send you many new devotees. Thank you very much. So give them protection and instruct them so that they may not go away. We recruit devotees with great difficulty. So they must be well-treated. New men may not always behave so nicely but we must be tolerant. To train a new man is like training a wild animal to be a pet. Just like the tiger is trained in the circus and later on they are dancing to the tune of the master. So the point being stressed is training. A preacher should always be tolerant. I am so glad to hear how nicely Tulsi is growing. That is the sign of substantial devotional service. Every center should be encouraged to grow Tulsi. If there is any impediment in growing Tulsi, that means that devotional service is defective. Yes, Jagannatha Deities may be carved and installed later on. So I will give you instructions how they should be installed. First of all, let them be carved. I am so glad to accept the devotees recommended by you for initiation and their beads and letters are enclosed herewith. Please offer my blessings to all the boys and girls there. Hoping this will meet you in good health. Please accept my blessings. I am in due receipt of your letter dated 5th July, 1971 and have noted the contents carefully. I am so glad to hear that you will be going with Brahmananda Maharaja to Africa and that Harold Prabhu will be going also. When I was in Bombay, Brahmananda Maharaja told me about you and I agreed that it would be nice if you came to assist him in his mission. So make arrangements immediately for going. Yes, I will be very glad to initiate you both before you embark. Depending on whether or not there will be a function in Mayapur in mid-August, I will be going to N.Y. If the Mayapur program is fixed up then I will leave for N.Y. by the 15th of this month. Otherwise, I will be staying in L.A. for some time. So if I go, then you can meet me there, or if not you can come here. Actually it is better to take initiation personally and receive instructions before leaving for Africa. So you can make arrangements accordingly. Please offer my blessings to Karunamoya Prabhu at the University of Massachusetts. Ask him to write me and let me know how his preaching program is going on there in that five-college area. Please accept my greetings and blessings for all of you. I am very anxious to know about Mayapur. Since I have come here I have not heard from you. I have sent one telegram to Tamala but there is no reply. So will you kindly send me a detailed report of your activities regarding Mayapur affairs? Please send me a report every week & oblige. I have requested Acyutananda Swami also to send me weekly reports. But I have not heard from him also. Please treat this letter as urgent and reply immediately. Please accept my blessings and offer the same to the other artists. I am in due receipt of your letter dated 19th June, 1971 and addressed to London. The letter was just now forwarded to me here in L.A. and so this late reply. The demigods, when they try to ascertain who is the Supreme, they become bewildered, what to speak of ordinary men. Their senses are also limited. Therefore the speculation process is condemned. The picture is fine. There is no need to show the demigods bewildered. I have already explained in my previous letter that inside the body the soul is suffering and that suffering is expressed by the bodily features. Everyone in this material world is suffering. So simply the idea is there, that's all. All the details it is not possible to show. Krishna in a boat with the gopis, that picture is all right. He is enjoying. This is spiritual rest and enjoyment. That is the real feature of the Supreme Personality of Godhead. Why should he work? So finish the picture nicely. The idea is all right. The monkeys with Lord Rama are greyish with black face. Why Ramacandra has only one ankle bracelet? They should be on both legs. Yajna is bluish; Mohini is extraordinarily beautiful woman. There is no comparison to her beauty, so much so that Lord Siva is captivated by her beauty, what to speak of others. Vyasadeva did not speak all the Vedas to Ganesa. He simply dictated. But the picture is all right. Ravana has twenty arms, 10 heads, and he is blackish in color. The tortoise incarnation, his head portion should be Visnu, as I have told you in my last letter. Kalki should be on the horse's back with sword in hand. It is not clear in the picture. You can make Radha Krishna appear in this in picture for B.G. ch. 5, vrs 4-6. Radha Krishna includes Laksmi Narayana. Then the picture will be more clear to the reader, as you have mentioned. The bhakta worships the Deity in form and the Sankhya meditates on the Deity in the heart, so the Deity is there in either case, so they are the same. But impersonal meditation is not bona fide. Personal meditation is bona fide. So one has to attain any state by Bhakti. Without bhakti, there is no chance of perfection, either to merge with Krishna or to become an associate. Bhakti must be there. But the sort of Bhakta who is trying to merge, that is not pure bhakti. You write to say that you do not understand this movement, but if you do not understand this movement after so many years then when you will understand? You have been in this movement since the very beginning and you say that you don't understand. How is that? And you have so many questions. That is all right, but you will go on questioning throughout your whole life and never understand. So what is the use of asking questions? You have complained about those devotees who have mistreated their wives and children, but that is not the example. Those who have deserted this movement are not the example. So why are you citing them as example? There are so many devotees like Dayananda, Syamasundara, Hayagriva and others who are living with their wife and children very peacefully. There are so many. So why take bad examples; there are so many good examples to be taken. I have gotten married so many of my disciples. Gurudasa, Tamala, there are so many living peacefully. If someone has deserted, then he is wrong and not the example. So you are a grhastha. You should set an example. I do not know why you left Europe without consulting me. Who made you obliged to leave Europe? You were engaged in translating work and all of a sudden you left and now you are complaining about others. I was so much surprised when you left Europe. Anyone who is somehow or other engaged in the society's work, their position is higher. GBC members are simply to see that things are going on. Other centers have got president, secretary, etc. and they are managing separately. That is the formula. So how is it that the GBC are the final authority? They are simply to examine that things are going on nicely, that is all. And if you are unable to give 50% of your income, then who is pressing you? It is voluntary. If you have not got any means, then who is exacting you? So these things are specifically happening to you, not to others. There are so many grhasthas and they are not feeling any inconvenience. They have dedicated their lives to the service of the Lord. And most GBC members are householders. You also may be elected. The position is open to all grhasthas. But if you live separately with your wife and earn only for yourself and your wife, then how you expect to have a good position with the society? Everybody is earning for their wife and family, so if you are doing so also, then what is the difference between such endeavor and that of the karmi? There are many grhasthas who are earning and spending for a particular center. Similarly you also can open a center, live separately as president and maintain the temple nicely. But if you don't do anything and simply remain grhastha, then what is the use of criticizing others? The whole movement is meant for rendering service. Please accept my blessings. I beg to thank you very much for your letter dated 21st June, 1971 and have noted the contents. So far Moscow is concerned, there was only one substantial meeting, with one Professor Kotovsky and the tape of that conversation is being transcribed. Also I have written an introduction to the three lectures I had proposed to deliver in Moscow: 1) Vedic conception of Socialism and Communism, 2) Scientific values of a classless society; and 3) Knowledge by Authoritative Tradition. These are yet to be written. Photographs have been taken also. So I will collect all the material available and send it all to you in the very near future for publication in BTG. I have seen the newsletter and it is nicely written, but the idea itself is not so good. If you post such newsletter to big businessmen and politicians, etc., their secretaries will throw it away. It is not so easy to approach such big people by letter. An attempt to see them personally is better. Otherwise it is a waste of time. Thousands of advertisements are going in the mail. Who cares for them?